The Hippopotamus is a big, fat mammal with a rounded shape body. The Hippo spend most of the day in water. It is one way they protect themselves. lips to gather grass and large teeth to chop it up! Hippos DO NOT eat MEAT. They have fat, which helps keep them warm in the water. Their eyes, ears and nose holes are on the top of their head so that they can float in the water and see, hear and breathe. easily. 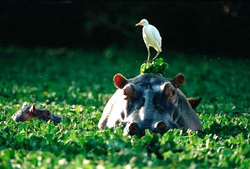 Hippopotamus are not friendly animals. They will attack other animals with their LARGE MOUTH if they come near them. They don't like others in their water, unless you are a friend, like this bird! The like these birds because they help keep them free of insects. 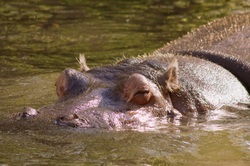 The hippopotamus sleeps on and off during the day while in the water. They don't like water too deep. They like to be able to walk along the bottom. Click here to see pictures to print or Here.